Featured in the “Virtual Tour” were the sites featured last year to get a feel for what has changed in the last 12 months before adding in four new sites to the mix. Last year’s participants were Foam & Wash, Wappingers Falls, NY; Hoffman Car Wash, Saratoga Springs, NY; Sparkle Car Wash, Easton, PA, and Valet Auto Wash, Lawrenceville, NJ. The new sites featured were College Park Car Wash, College Park, MD; The Great American Car Wash, Severna Park, MD; Wash Co., Middletown, NY, and Wiggy Wash, Orem, UT. On Tuesday, October 2, seminars kicked off with a traditional Early Bird where no carwash topic went unturned. Led by Turnpike Car Wash’s Bob Katseff, this seminar hopes to answer questions in a panel format, unscripted and honestly. It also includes a full breakfast spread. The next seminar, Dissecting the Club Plan, led by College Park’s Dave DuGoff, exposed the many ways to create a profitable wash club program. A seasoned panel of operators shared their knowledge in running their own programs. It was a great format in which to learn what works and what might not in your market. Next up was Hoffman Car Wash’s Director of IT, AJ Davison, who spoke from first-hand experience on how to protect a wash from cyber attacks. His honest story of how his company experienced a breech was insightful and helpful to attendees to instruct them on how to better secure their customer data. Keynote speaker, Jay Rifenbary, a former West Point grad, shared his life experiences and core values in a lively presentation that focused on interpersonal skills necessary in establishing core values, accountability and balance in everyday life and business. Following Rifenbary’s Keynote Chairman Rieck led the annual award’s program by presenting Jule Gapp of Hoffman Car Wash with the NRCC’s newest award, the Emerging Leader. This award was created to recognize up-and-coming managers who have demonstrated exceptional leadership and customer service skills. 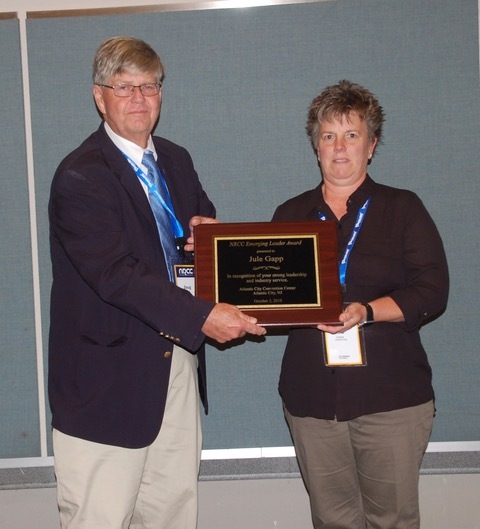 Gapp is a manager who has worked her way up the ranks to run one of the company’s most innovative and high-volume sites in Saratoga Springs, NY. 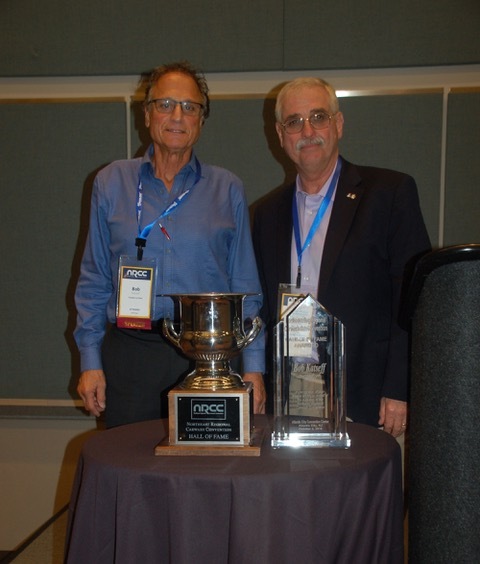 Mike Conte, the Car Wash Operators of New Jersey’s immediate past president, then awarded Doug Rieck with the Most Distinguished Person Award for his tireless efforts serving on the NRCC board and as Chairman for the second time. 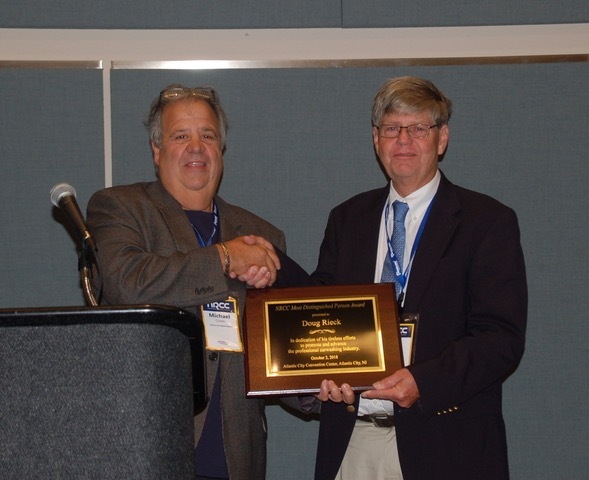 Rieck then asked Randy’s Car Wash’s Ron Bousquet to introduce the Hall of Fame recipient, Bob Katseff of Turnpike Car Wash. Katseff, who has been involved in the NRCC seemingly since its inception 29 years ago, has demonstrated unyielding service to the show and its mission. This award is the NRCC’s highest honor. His long-time friend, Bousquet, was honored to bestow the accolade. After a long day of education and exhibition, the annual Welcome Reception sponsored by Innovative Control Systems of Wind Gap, PA, was a great way to relax, unwind and catch up with fellow attendees at the Water Club’s pool. The event includes an exceptional spread of food and drink compliments of the sponsor. The show’s final seminar, Wednesday, October 3, was presented by Paul Fazio of SonnysOneWash who did a state of the industry. His history in the industry and unique take on its evolution provided attendees with a broad prospective of where we are and where we are headed. He stressed, however, that despite growing consolidation in the industry it is still comprised of family-run operations and that will continue in his opinion. 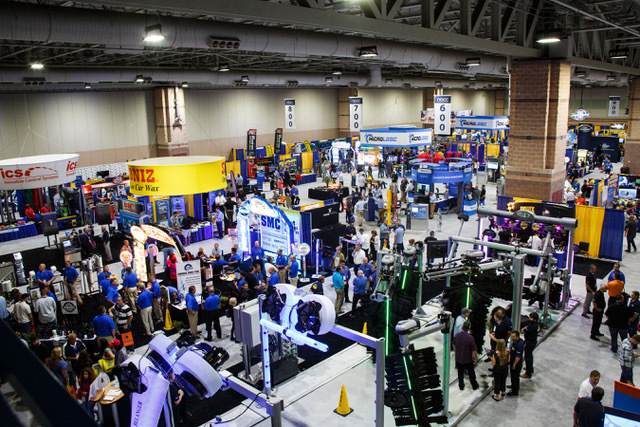 Show hours ran on Tuesday afternoon and Wednesday morning and also featured vendor-run seminars called “Inside Looks.” This is an opportunity for vendors to hold their own half-hour programs to educate attendees. 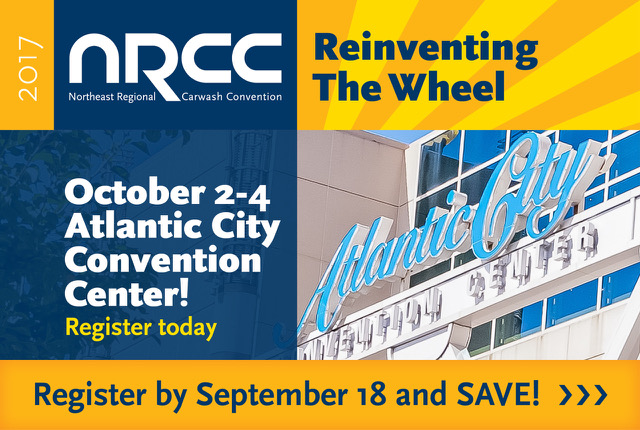 The NRCC is an annual event and the combined efforts of the Car Wash Operators of New Jersey (CWONJ), Connecticut Carwash Association (CCA), New England Carwash Association (NECA), Mid-Atlantic Car Wash Association (MCA) and the New York State Car Wash Association (NYSCWA). Each association takes a turn hosting the annual event. For more information on the NRCC visit nrccshow.com or call 800/868-8590.